Munster Park is in Fulham, and the chapel was part of the Hammersmith Circuit. 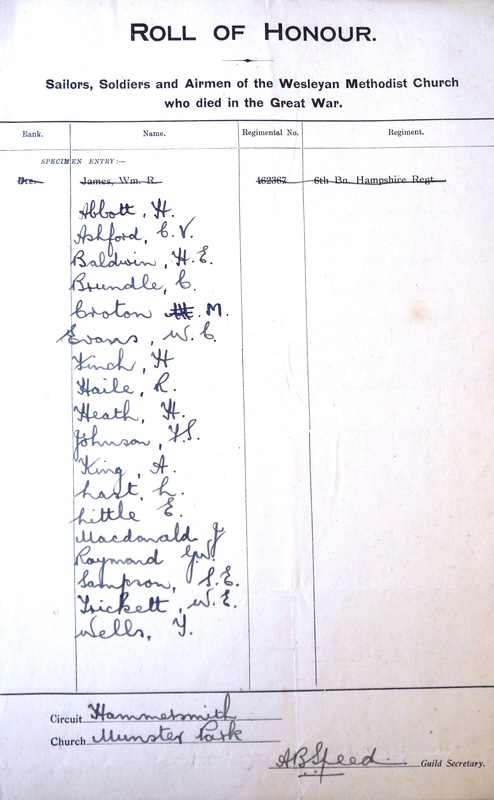 The Guild Secretary produced a list of eighteen names, without further details. This appears to be their only memorial. No memorial has been recorded as being in the church, and the men do not appear on any memorial known to the Imperial War Museum. The names have been checked against the records of the Commonwealth War Graves Commission, and the IWM site ‘Lives of the First World War’ but only eight can be matched with any certainty. They are in bold type in the list which follows.